Encouraging science journalism: The genome of Kennewick Man. Last week saw the announcement (also from Eske Willerslev’s lab group: they’re amazingly prolific) of the sequencing of yet another significant ancient American genome: the 8,500 year old skeleton from Washington popularly called “Kennewick Man.” This time the press did an exemplary job of covering the news. 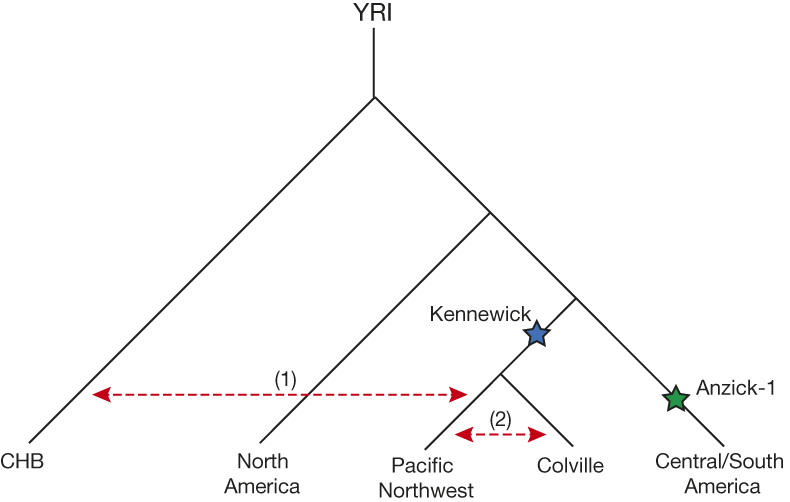 Figure 3 from Rasmussen et al, showing how Kennewick Man’s genome relates him to other Native American populations. The genome of a famous 8,500-year-old North American skeleton, known as Kennewick Man, shows that he is closely related to Native American tribes that have for decades been seeking to bury his bones. The finding, reported today in Nature, seems likely to rekindle a legal dispute between the tribes and the researchers who want to keep studying the skeleton. Yet it comes at a time when many scientists — including those studying Kennewick Man — are trying to move past such controversies by inviting Native Americans to take part in their research. And writing for the New York Times, “New DNA results show Kennewick Man was Native American”, Carl Zimmer not only discussed the science and the controversial history of the research in a thoughtful way, he also quoted Native American community members and scholars (including my colleague at the University of Texas, Kim TallBear) to explain why Kennewick Man is so significant and why some Native American groups in North America are reluctant to participate in genetic research. He also interviewed me, giving me the chance to talk about efforts in American anthropological genetics to make the field more inclusive, such as the Summer Internship for Native Americans in Genomics program. (On a personal note, it was thrilling to be interviewed by one of my favorite science journalists!). I think that many readers of this blog will find these article interesting, particularly those who argued in a previous comment thread that Kennewick Man must be European because of the way his skull looks. In any case, I was pleased that the focus of the majority of news articles that I saw was not on giving credence to discredited ideas about Native American history, but rather on discussing the scientific, legal, and social implications of this work. The field has moved on to more interesting questions than whether Europeans contributed to the ancestry and culture of ancient Native Americans, and it’s encouraging to see that the media has as well. Finally, I want to give particular credit to the journalists for writing such excellent stories under such a short time pressure: Nature gave them only about 24 hours’ notice before the embargo was going to be lifted. They aren’t pleased about it. Rumor has it that this ridiculously short embargo was related to the appearance of Eske Willerslev on a PBS documentary this week in which he talks about the results, and the need for the paper to be published before the program aired. *Many thanks to Roger Echo-Hawk for suggesting this phrasing as being more accurate and more useful. Talking about the relationship between genetic ancestry and cultural identity is very difficult, and a lot of the language that we geneticists use implicitly (and inappropriately) reinforces racial categories. That is never my intention, but it is often difficult to identify in my own writing, and so I always welcome feedback on this! Related: I’m keeping an eye out for how the fringe archaeology blogs handle this subject, and I might revisit it in a future blog post, if it seems warranted. If you find any particularly interesting treatments of this topic, please drop a link to it in the comments! Next Article Public outreach that’s inaccessible to the public. I’ve seen that guy ranting before in the Anzick and Naia Nature articles.Funny thing he goes on a rant about teeth and then mentions Spirit Cave Man.I guess he’s not aware that Turner and other dental anthropologist had actually looked at that specimen and said he had “severe shoveling of the incisors”.I guess he’s not aware of the work of Christopher M. Stojanowski and others on ancient american remains.It would give him such a huge heart attack if he did.Let the desperate trolls ramble. K-man’s mtDNA kind of caught me by surprise.I guess he’s now the oldest representative with this haplotype and it’s at the root of X2a and it’s found on the NorthWest and not East Coast giving another fatal blow to the Solutrean Hypothesis. Btw Jennifer did you ever check that email I sent you?I’ve never seen such manipulation of facts to push an agenda.I thought those type of ideas were long gone but it still prevails in the fringe history department and in racist circles.Well you can’t really separate the two.These types are all over the internet. Andy White did a blog post of a perfect example of how fringe historians still using old victorian ideas. Thanks for the link to Andy’s site! It looks really excellent. Just a minor bit of nitpicking there, A.D.m after I offer my thanks for bringing Exmormon websites into the discussion (Kennewick Man’s X2a haplogroup also destroys the last remnant of hope for any credible evidence that Middle Eastern DNA arrived here via a migration from Jerusalem circa 600 B.C.). “Simon’ is Simon Southerton, not Southerland, and he’s a close friend of many years. I was privileged–along with another friend–to be able to pass on the information about the Nature article to him. To describe his reaction as ecstatic is an understatement. Here’s his blog on the subject. Simon’s target for his scorn, Rodney Meldrum, is one who’s made a cottage industry with fringe claims of “Ancient Middle Eastern DNA found among today’s Native Americans” (along with Wayne May). Meldrum enjoys the support of many LDS luminaries, including Alan Osmond and Sen. Orrin Hatch. There’s obviously no love lost between these two men). The Spirit Cave Man is without a doubt more European looking than Kennewick and DNA test would show that too. The only thing in common these two guys have is probably belonging in to the same maternal DNA, which by itself doesn’t mean much. That is just laughable. Which East Coast remains have failed to yield X2a? The Windover Bog mummies who are almost as old as Kennewick were all X2a. Kennewick mtDNA is evidence of decline of the Clovis, their women taken as trophy by the Siberian invaders. X2a becomes less common as Siberian invaders Mongolize the place, present day natives in the west barely have this mtDNA. You need to review the later findings on the Windover Bog DNA. It was determined the DNA was too degraded to yield any meaningful results. That hasn’t stopped the cherry-pickers among the “hyper-diffusionists” from cherry-picking discredited information and using it further their agendas. And I’m sorry, but the Anzick child essentially proved that Clovis people were descended from Mongolians, as was Kennewick Man. The “Solutrean Hypothesis” is simply silly and unsupported by any evidence except that claim by Stanford about finding a spear point off the Atlantic Coast. Occam’s razor applies here, and the most likely source was from the ballast of a 16th or 17th Century ship that sunk in that region. That has been a common problem for all European-like skeletal remains. Their DNA for some strange reason cannot be re-tested, and access to the remains is forbidden. The Windsor Bog remains yielded from than a hundred individuals. Why not test them now, DNA extraction methods have greatly improved from 2-3 decades ago. We can even test Neanderthal remains now. I’m all for it. Why not test the Windover Bog people? Solutrean theory rests on an Eastern coast colonization. So any Solutrean survivors, even watered down after the Siberian invasion would survive the longest in the Eastern Coast where Clovis population was mostly concentrated, according to the Solutrean-Clovis theory. Testing the Windover Bog remains would literally break the Solutrean theory if these guys turned out to be regular Injuns. So how about it? Ready to prove “evil” people like me wrong? I somehow sense the suggestion makes you crap your pants. Anzick child was not Clovis, so it does not matter if he was pure Han Chinese. It has no bearing on the Solutrean theory. “Paleoman” is claiming “Anzick child was not Clovis”? I’ll let Jennifer speak on her subject of expertise and i’m sure she’ll tell you in no uncertain terms that the Anzick child was Clovis. Everything points to this reality, the burial objects, the C-14, and now the DNA. I will however, speak to a subject of my experise. As an old English teacher your misuse of the word “theory” is another howler. You might get away with it in other circles, but among scientists, the word is “hypthesis.” And the Solutrean Hypothesis has been repeatedly discredited, your “because I said so” claims not withstanding. I’ll also address another issue I have grad-level training in; in this case it’s psychology. You’re writings are a textbook example of denial. To put it bluntly, and to borrow your ad hominem, the only “crap” is coming her from your keyboard via the Internet. Who is Jennifer? I was not aware that if she endorses something, it becomes an established fact, written in stone. Maybe I’m failing to connect something here. Now the Anzick child dates to period after the Clovis crashes. The Clovis tools in the site are older than the Anzick human remains. This is plain bad science, very likely deliberate too. Let me summarize the Solutrean-Clovis theory, because I don’t think you grasp it yet. Solutreans land in the Eastern Coast. Whether only once or multiple times, it is not known yet. This group of Soultreans begin to flourish in the East coast and expand all along the Eastern coast. A big part of their diet came from the sea, that was their niche. This flourishing culture evolves into Clovis. The Younger Dryas period causes food shortages and the Clovis people being a westward migration. At the same time Siberian corridor opens and the Siberians flow down the Great Plains. The Clovis people lose against the Siberians and the rest is history. In that context, the Anzick site would have been only temporarily occupied by the Clovis as they were moving west. It is also at the limits of Clovis occupation, a frontier area. The Anzick child who is post-Clovis represents the victorious Siberians and not the Clovis. The whole timeline of events fits the Solutrean-Clovis theory. OK English teacher (boy do I feel puny), learn to spell hypothesis please. Is this the best you can do? Frankly, I’m thinking some remedial reading is in order; your “because-I-said-so” statement, “The Anzick child who is post-Clovis represents the victorious Siberians and not the Clovis. The whole timeline of events fits the Solutrean-Clovis theory” is pretty lame. The Anzick child is clearly Clovis, and there’s zero evidence the Solutreans ever made it to North America. But hang onto your fantasies; just don’t try to peddle them as authentic science. Randy you’re the only lame loser in here. Anzick by simple timeline cannot be Clovis since Clovis ceased to exist around 13,000 years ago. Anzick child is 400-600 years post-Clovis. You’re clearly mentally challenged if you can’t how impossible this is. More like a sh!ty English teacher. Here’s a word you never grasped its meaning, excuses, stop making them. You’re clearly mentally challenged if you can’t see how impossible this is. Paleoman, I’ve let you have your say, but you’ve repeatedly violated the commenting policy here by insulting other commenters and you’re not adding anything substantive to this discussion anymore. Goodbye. I noticed you ignored my enthusiasm to test the Windover Bog people. Why not? Aren’t you progressive? And you seem so sure that the Solutrean theory is impossible. Don’t you want to stick to the ‘evil” folks like me? I’m curious how, because haplogroup X2 is very rare among present Europeans(1-2%). What are the odds that some Euro-American contaminant the Windover Bog samples with an X2 haplogroup? Hint the answer is above. BTW, for those interested, Paleoman is doing a version of the “Gish Gallop” with his dissembling and all-over-the-place nonsensical tactics. Those interested are invited to Google that subject. Gish Gallop(are you even a man? ), sure there little Randy. Hey don’t snap on me. I saw it in passing as I was grabbing the URL for my post this morning, but I had to leave for work and won’t have a chance to delve deep into it until later this afternoon. I thought I saw him complaining about no mention of KM’s alleles for hair and skin color…he obviously didn’t read the paper, or he would have seen that they only had 1X genomic coverage. That’s not enough to have confidence in any particular SNP call, especially for ancient DNA! (The authors have shown through simulations in another recent publication that 1X coverage is effective for confident ancestry determination. But that’s obviously a leftist approach!). Anyway, I’m looking forward to reading it more carefully. I wonder if anyone will respond to him. Ha! Good catch… My unconscious bias is showing. I don’t engage in such blogs, but I’ll be glad to share my “fringe” ideas. Before I start let me congratulate you guys for agreeing with anything mainstream, must be the mark of a genius. I for one do not have this amazing ability to parrot “authority” or “expert” truths and feel awfully smart about myself. To begin, I’m one of the few folks who is convinced by the Solutrean theory that never saw Kennewick man as some European. His skull was awkward and my thought was he is likely mixed, a watered down Clovis. It turns out he is not even a Clovis survivor, maternally he is, but the male paternal line he belongs to is that of the tribe that killed the Clovis and took their women. And his autosomal DNA is pretty much native American. Kenewick belongs to maternal haplotype X2a which would have been brought by the Solutrean migrants and spread westward by the Clovis expansion. There’s a graph in the paper that shows his relationship to modern day populations. Kennewick has a very slight shift towards Europeans compared to the present Northwestern tribes. It would be interesting what his K12 looks like. Paleoman, your comments are disturbing in that they have a tone of white supremacy and are scientifically flawed. Who am I trying to be supreme over? Get lost loser. Paleoman, please adhere to the commenting policies. Name calling does not contribute to the conversation. Interesting logic here. Next time you go to hospital remember to tell your doctors and nurses not to bother washing their hands or sterilising instruments; clearly the germ theory of disease is mainstream nonsense put about by “experts” and you know better than to trust their “authority”. That is hilarious, because all those scientific leaps you mentioned did not come from dull masses like you. If it was for the likes of you, the Earth would still be flat, because your doctors or other untouchable Gods said so. The idea of a flat earth was a 19th century fiction. The ancient Greeks onwards knew very well that the earth was round. Not sure what your point is. Sorry, but your claim, Kenewick belongs to maternal haplotype X2a which would have been brought by the Solutrean migrants is nonsense. X2a arose very early in that haplogroup, and while its origins are unknown at this time, all four of the other hg’s, A, B, C, D, exist in the Lake Baikal region, and they are not closely related to European strains. It’s absurd to think that only a single haplogroup arrived with those mythical Solutreans; absence of evidence is not proof of absence, but it is evidence for it. And Kennewick Man’s autosomal DNA shows he was part of a population that was ancestral to Native Americans and is most closely related to Central Siberian populations as well. I’m not sure what your point of the reply was other than calling an obvious truth nonsense. X2a is a lineage that can only have come from a parent source in the other side of the Atlantic. Learn to speak, that doesn’t make any sense. It arose from what rocks? No one is disputing the other four, do you like being redundant? The Siberian migrants came from somewhere, and these are their mothers. Yes he was, with slight pull towards present day Europeans. That could either be from ANE which would not make him Solutrean but old shared paleo Siberian ancestry(Malta kid). But if this pull comes from WHG ancestry, than this would be do to small Solutrean mixture. I have a friend who’s stock answer to “hyper-diffusionists” is go take an ocean cruise. There is no way that Stone Age people could’ve accomplished a transoceanic crossing. Didn’t happen. No maritime compass, no way to sail 1,500 miles of open ocean. It all sounds nice and romantic–ask the wife if she wants to go on an ocean cruise sometime–but suggesting it is outside the realm of reasonable probability. Haplogroup X is a very old Hg, and even though it hasn’t been found in the Old World, to suggest it arrived here via an Atlantic crossing betrays an utter lack of knowledge of maritime sailing and the technology necessary to accomplish it. Right, they can’t do it because you or your friend can’t. Pacific Islanders were stone age people too, and they colonized most of the remote islands. Smart people through genius and iron will always find a way. And the so called stone age people of Europe are literally the most advanced stone age cultures we know about. The other piece of the puzzle is the Solutreans who we don’t know much about. They’re biggest invention was the needle, this points out that Solutreans were fishing culture, it specialized along the coast and expanded when it perfected its niche. Much of their habitat is under water, and we know mostly of the inland Solutreans who did hunting. It doesn’t matter how old it is, all that matters is the evolution tree of haplogroup X2. The closest cousin of the American branch are in Europe and the Mediterranean region. There is no way of escaping this fact. And now we have the archeological evidence to back up the theory. All we need is some genuine old skeletal remains to be tested just to put the final nail in the coffin. It’s difficult to fathom your motives for including discussions of the Polynesians in this debate (which you’ve utterly lost; if this were a chess game, my advice would be to resign). They didn’t colonize the South Seas until more than ten thousand years after the Siberian ancestors of today’s Native Americans made their migration down both continents (the exact routes are still a matter of debate and exploration; their origins aren’t). I’m forced to conclude you’re indulging in a “rhetorical shell game” in order to maintain your denial, and that’s a sad situation. Worse, there are those who believe your dissembling even though it makes a mockery of legitimate science. The part you left out is significant; the relationship between Old World and New World X haplogroup sequences occurred on the order of 20,000 years ago, and we can use a “molecular clock” to establish that time frame. MtDNA mutates at known rates, and science the “probability of large numbers” comes into play, we know the mutations extant in this hemisphere prove the “separation” took place eons ago. That reality establishes that the relationship is not a close one. Your claim “it doesn’t matter how old it is” is absolute nonsense. Just one little correction: Haplogroup X is a very old group, and the variety found in the New World, X2a, has not been found in Eurasia, which is what I was referring to. Other varieties of X have been found there, but the split between those Hg’s and X2a occurred very early and the others are not closely related. Simon Southerton details this separation here in his discussion of Kennewick Man.